When working from home, we all set out with the best intentions of being as productive as possible. Unfortunately our intentions usually go down like a lead balloon, thanks to the likes of procrastination and back ache (among other things). But what if these two working nightmares could be depleted by just having the right desk? I feel your scepticism but as soon as there’s numbers involved, I’m open to giving something a shot. Introducing Varidesk, the company producing innovative, adjustable desks that allow you to work comfortably whether sitting or standing (or anywhere in between). Varidesk claims that their pro plus series helps increase productivity levels by up to 46%, relieves body discomfort, increases mood and energy levels as well as much more. And with the amount of features these desks have to offer, it’s no surprise that they’re certainly offering something a little different in the office market. There are a variety of desks on offer from the company. The Pro Plus range prides itself on its no hassle assembly and flexible levels of adjustment to suit a variety of heights. So, whether you’re a titch or a tree or somewhere in between, they’ll be a Pro Plus desk for you. However, it’s not all about height. You, of course, need a desk that is both sturdy and easy to adjust/move. This range boasts a spring boost and dual handle frame that allows you to move the desk with ease. The addition of a weighted base ensures stability – no bolts, clips or clamps needed. The Pro Plus 36 has received 5 star rave reviews from hundreds of customers. Its no assembly required, two tier, slick design makes a brilliant addition to your current office make up and fits easily around your current furniture. And dependent on how much computer equipment you need to accommodate, it is available in three sizes (30, 36 and 48 inches). Not a fan of having your equipment spread across two levels? Why not try the Pro 36. This provides the same adjustment ability as the Pro Plus 36, only it allows you to keep all of your working space on one level. It also offers a pull out tray to give you extra keyboard space. Looking for something much smaller because you have very limited space? We’ve all had the office area that you couldn’t squash a cat into – never mind swing one. 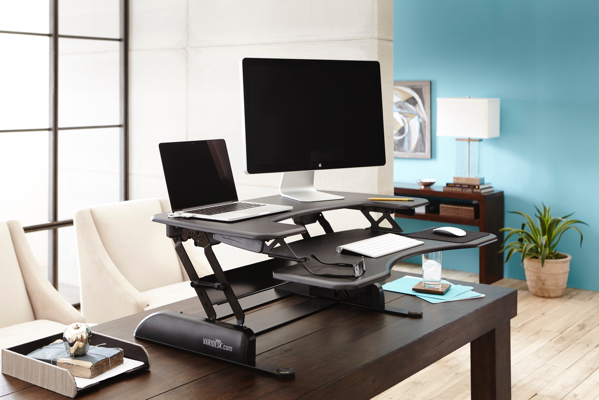 Varidesks Soho range offers spring assisted lift on a desk that’s the perfect size for your laptop and stationary. Alternatively, if you’re looking for the perfect addition to your corner office, look no further than the Cubicle range. This range offers all the pros of the Pro and Pro Plus ranges, the major difference being that it fits snuggly into both modular and corner spaces. Standing in the corner now only carries positive working connotations. Desk prices start from £150 and all desks are ready to use. For more information, visit the Varidesk website.